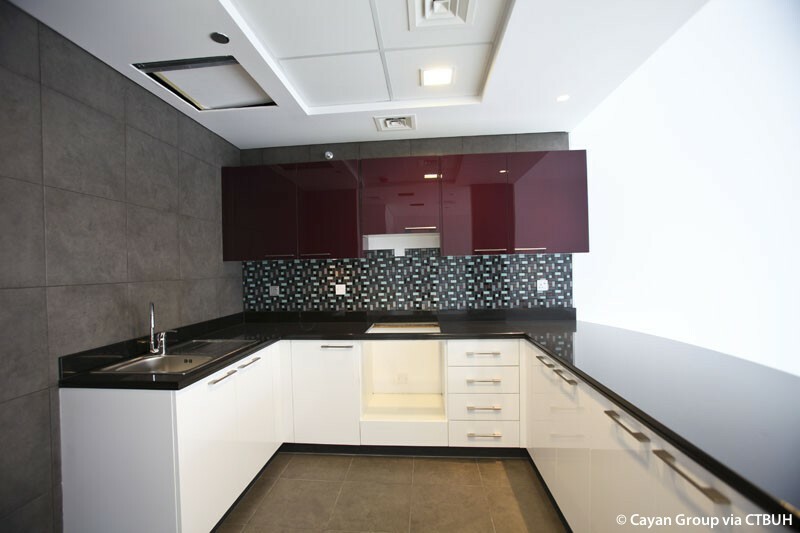 • Acoustics	 Cerami & Associates;	Shen Milsom Wilke, Inc.
• Cladding	 CSG Architectural Glass;	Jangho Group Co., Ltd. 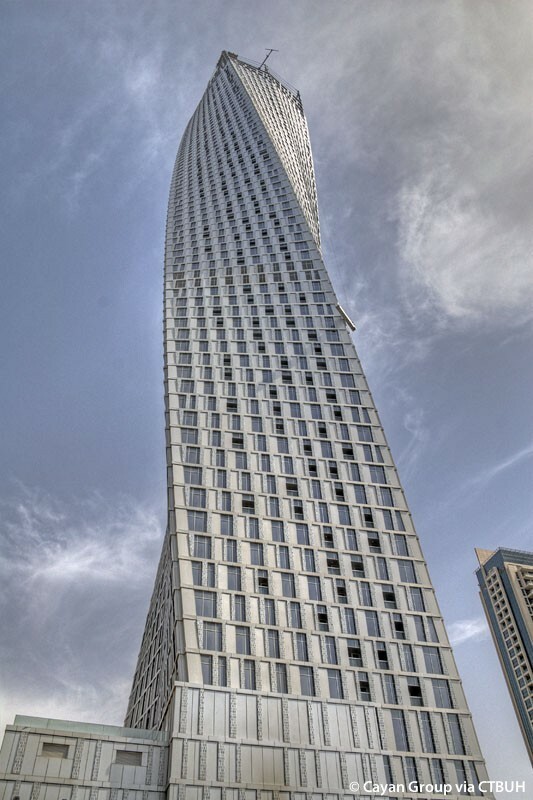 The Cayan Tower is a luxury apartment building with a striking helical shape, turning 90 degrees over the course of its height. 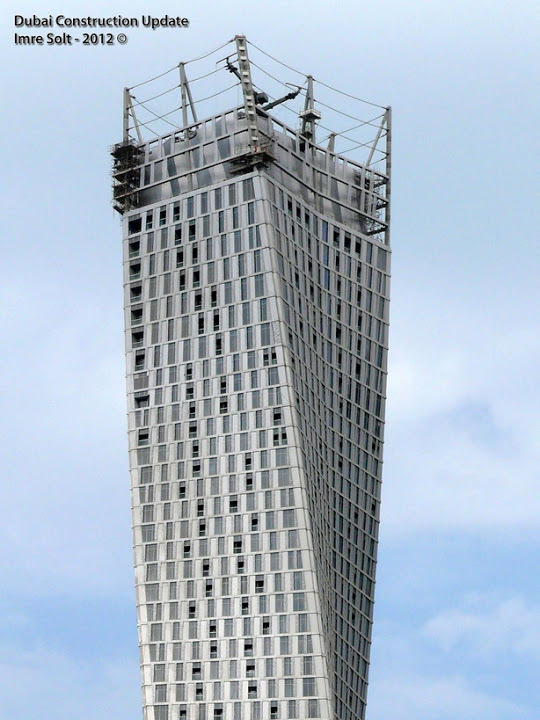 Each floor is identical in plan, but is set 1.2 degrees clockwise from the floor below, giving the tower a distinctive form by way of an innovative, efficient, repeatable structure. 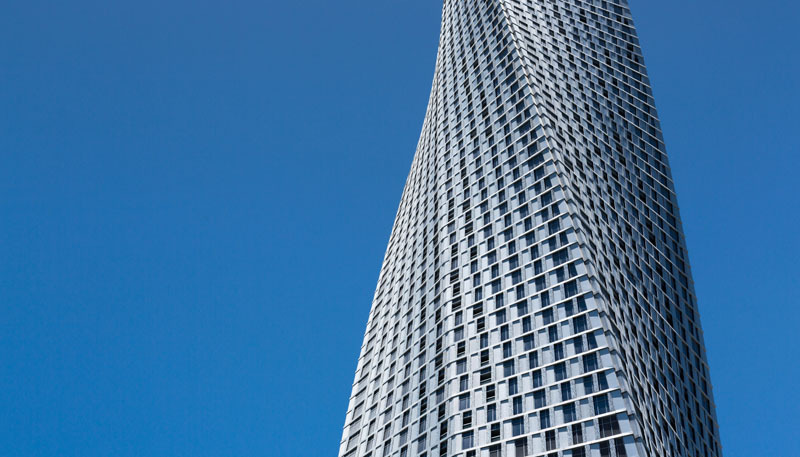 Its shape is pure expression of the relationship between a building’s form and the structural framework that supports it. 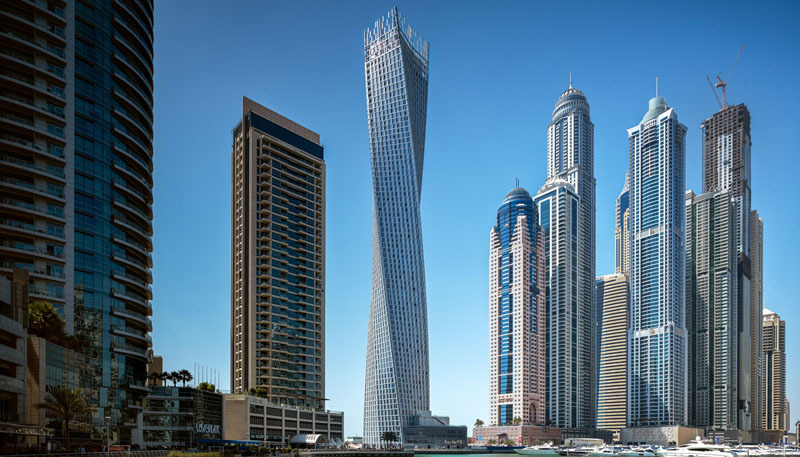 Aesthetically, the twisting shape makes the building stand out from the architectural disharmony of the Dubai waterfront, which is largely composed of indistinct towers that do not speak to their location. 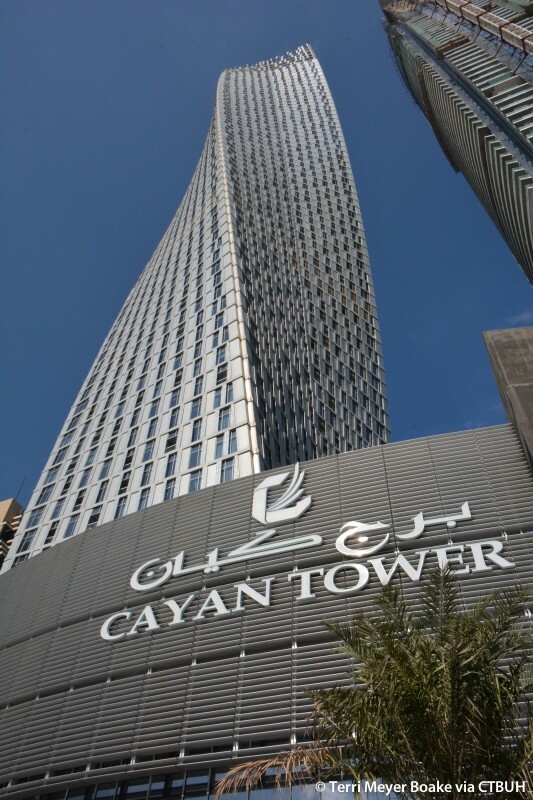 Located near Dubai Internet City, Emirates Golf Club, and numerous corporate headquarters, the tower’s twisting form provides a greater number of units with desirable views of the Dubai Marina and Arabian Gulf, while also preserving the views for residents living in neighboring buildings, ensuring that Cayan Tower enhances its spectacular waterfront site. 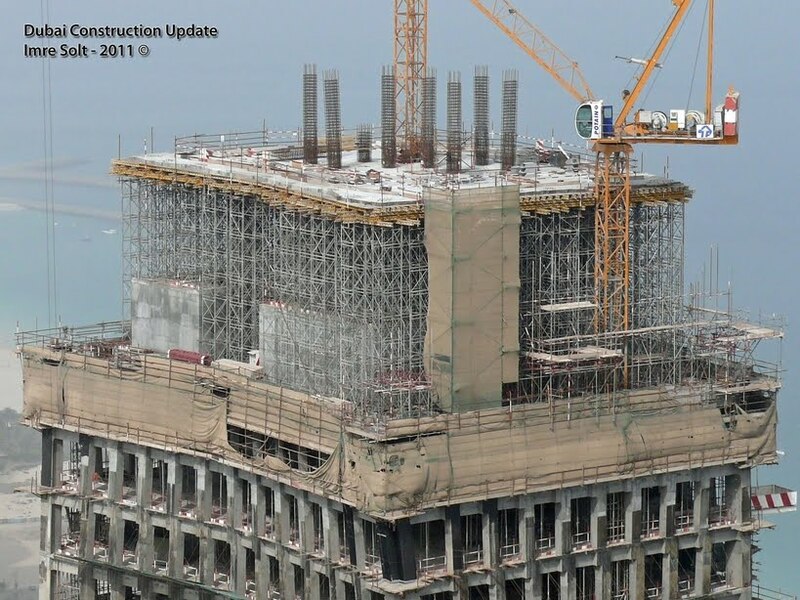 The tower’s structural system is a cast-in-place, high-strength, reinforced-concrete column superstructure. 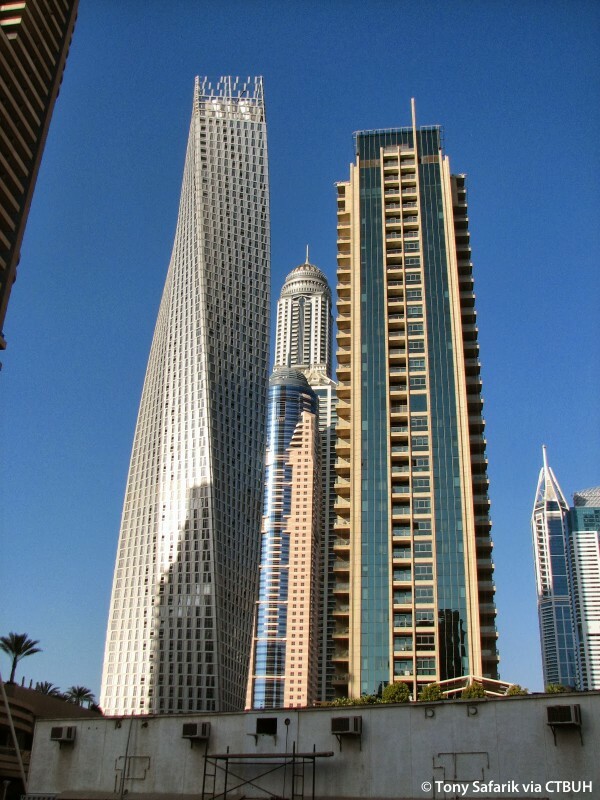 The shape and size of the columns were determined through the use of wind-tunnel testing and three-dimensional computer modeling to analyze building stresses. 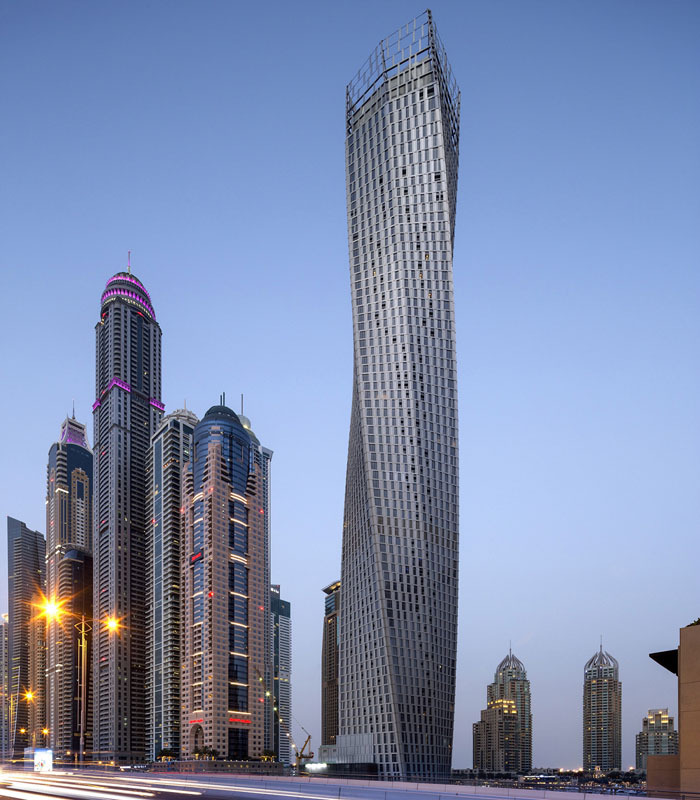 The building core is a cylindrical concrete form that acts as the central pillar for the tower. 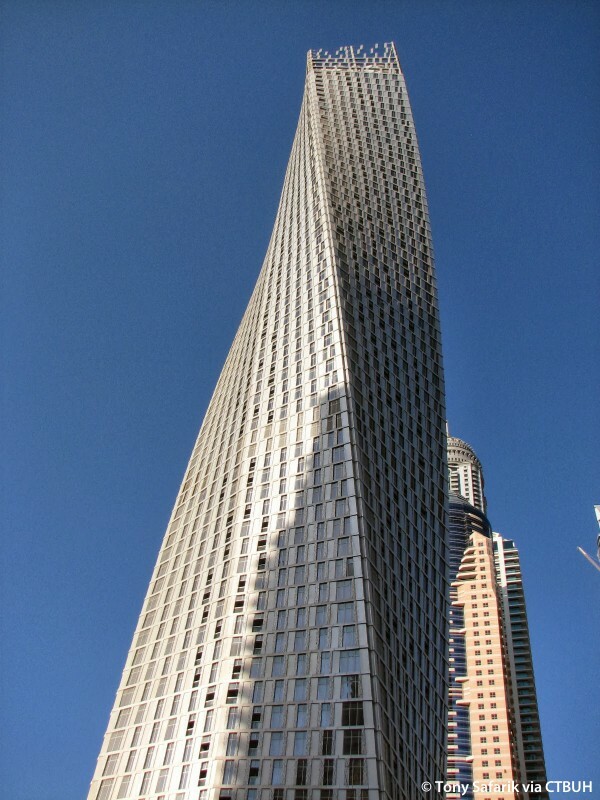 As the building ascends, the rotation at each floor occurs around this central mass. 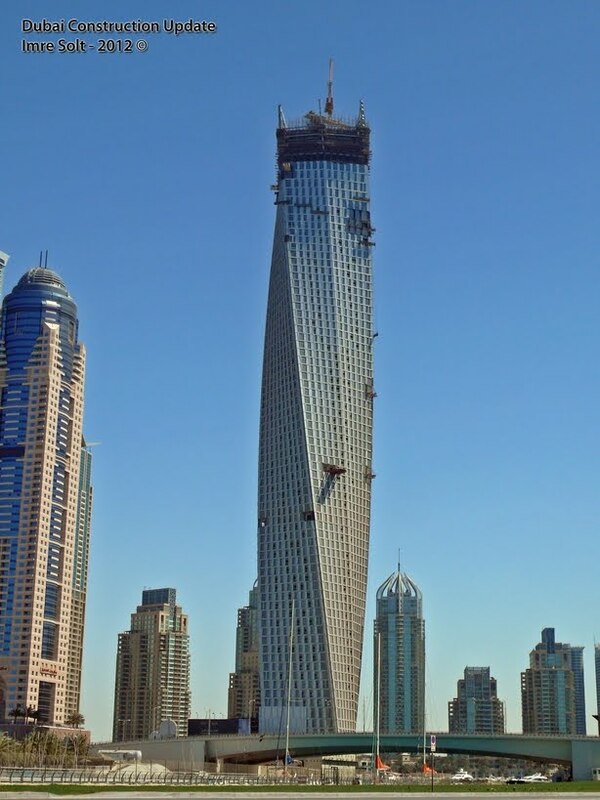 The building was constructed using a “jump form” system that takes advantage of its repetitive nature. 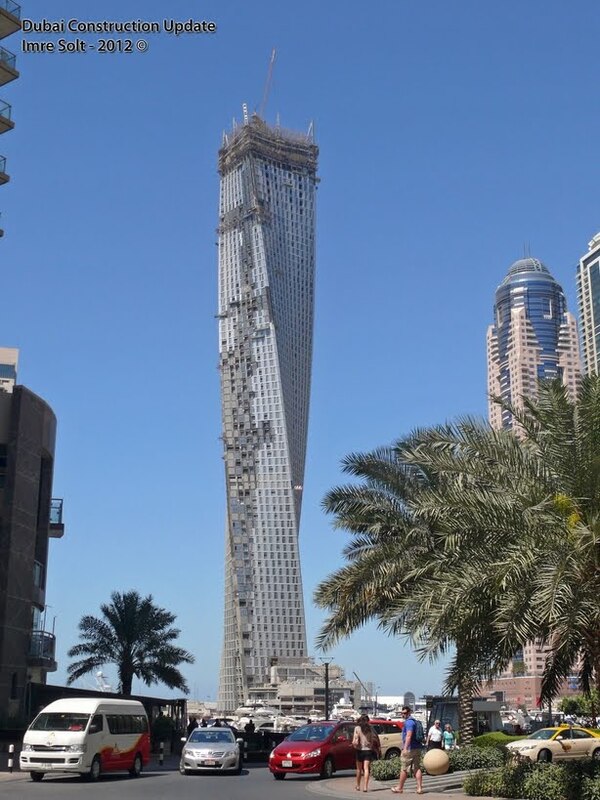 Even so, construction took seven years. 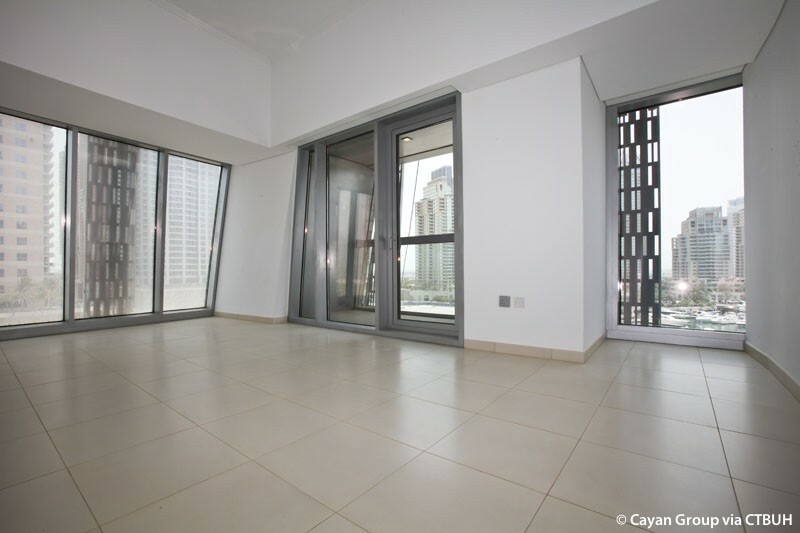 Within the tower, the units have been divided into six unique types, offering ample living space configurations to residents. 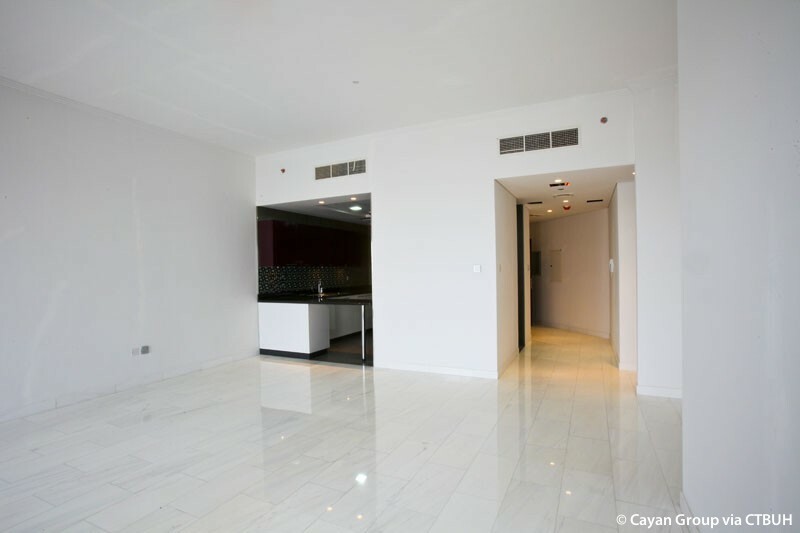 Standard units range from studios to three-bedrooms, and the crown of the building features six levels of both half- and full-floor penthouses. 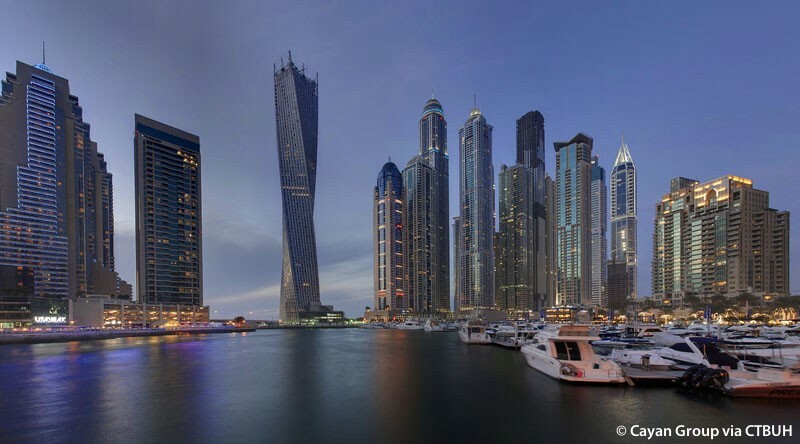 Residential amenities include an outdoor infinity edge pool facing the marina, flexible spaces on the sixth floor, a health spa, exercise facility, and conference centers. 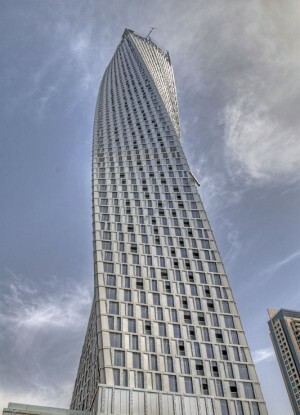 On the ground plane, the tower acts as an urban gateway, connecting the Arabian Gulf, the Dubai Marina, and the city beyond. 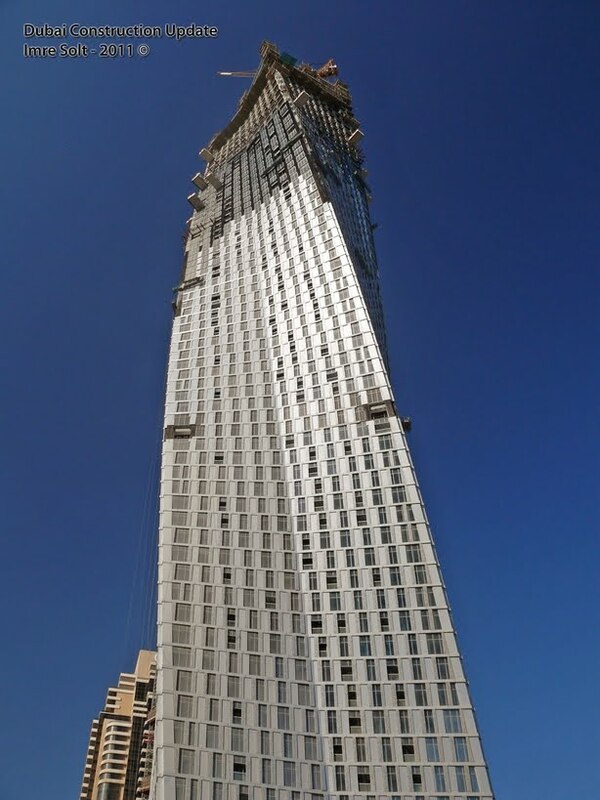 It also provides a visual point of reference on the city skyline. 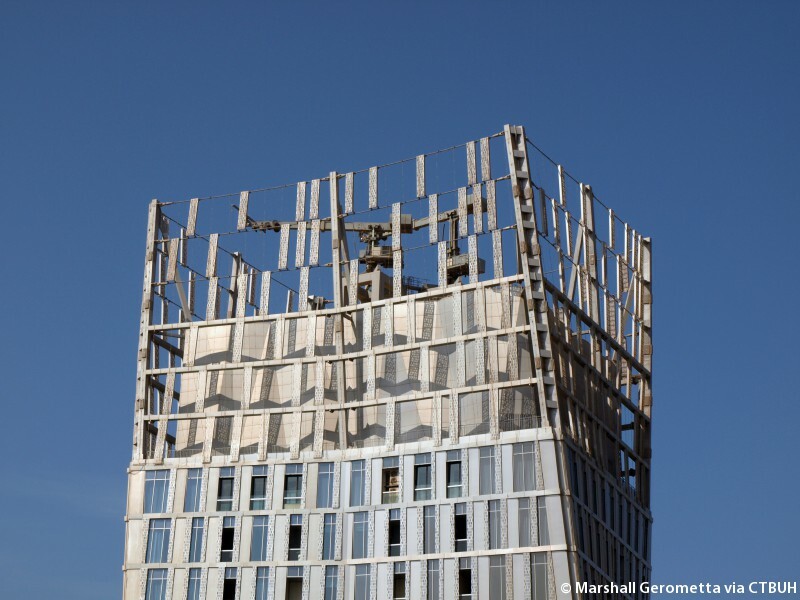 The building appears to change from every angle, giving it a sense of movement regardless of the viewer’s vantage point. 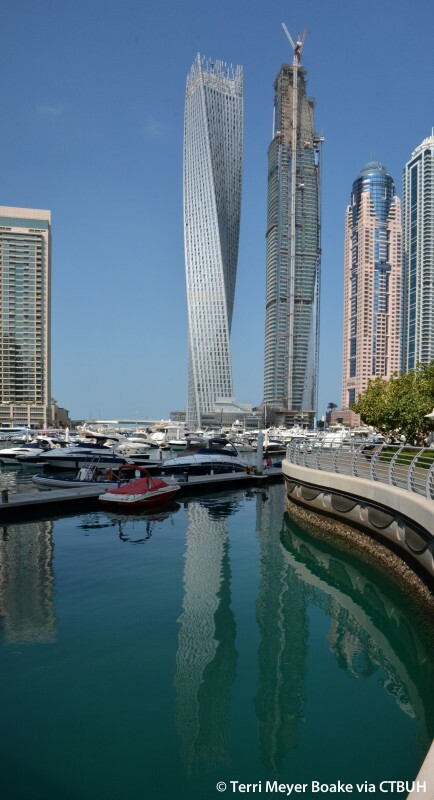 Within the marina, the public can experience this design detail firsthand by walking along the waterside promenade that edges the tower’s site. 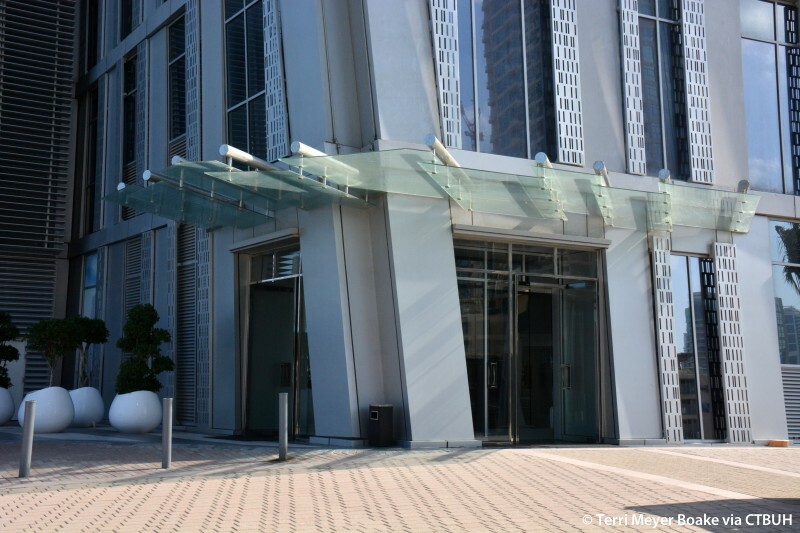 A retail colonnade, located at the tower’s base, also provides visitors with shopping, shade, and views out toward the water. 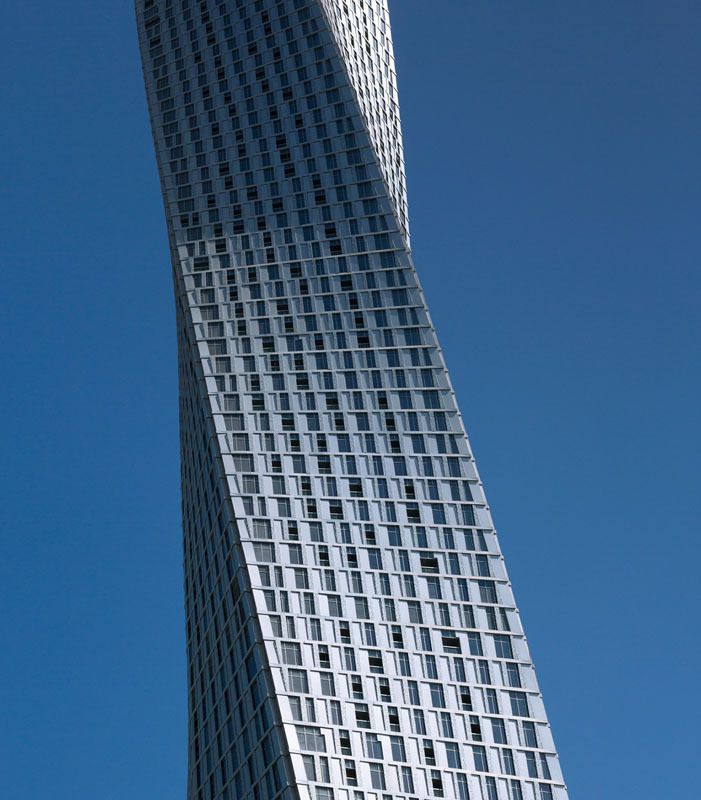 The tower’s twisting shape is designed for enhanced indoor comfort. 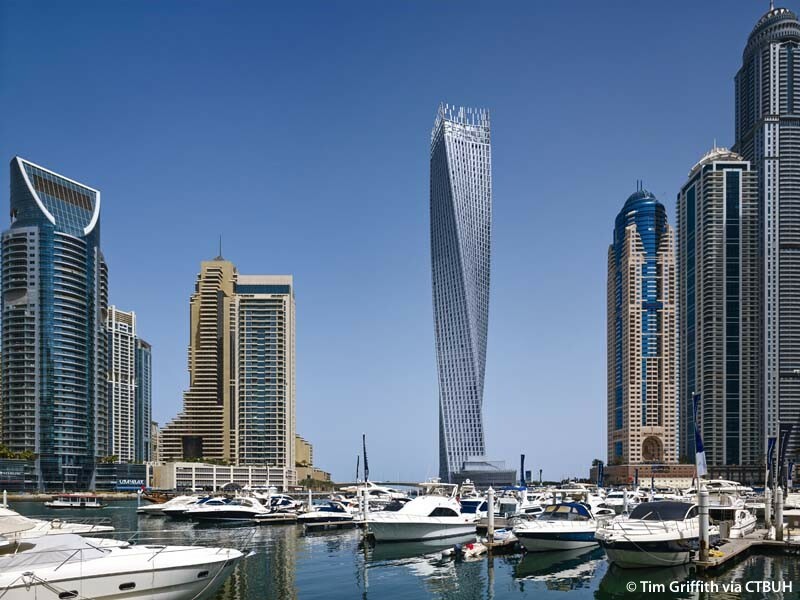 Its twist generates self-shading for the tower, ensuring that many of the interior spaces are protected from solar exposure. 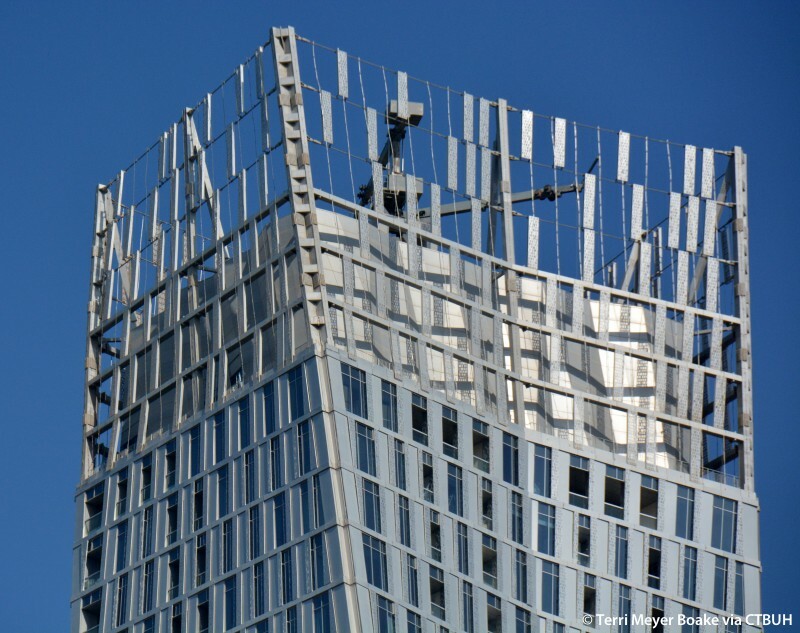 The building’s exterior terraces and the façade’s metal cladding panels, high-performance glass, and deep sills around the recessed glass line further protect the building from direct solar radiation, while providing diffuse daylight to interior spaces. 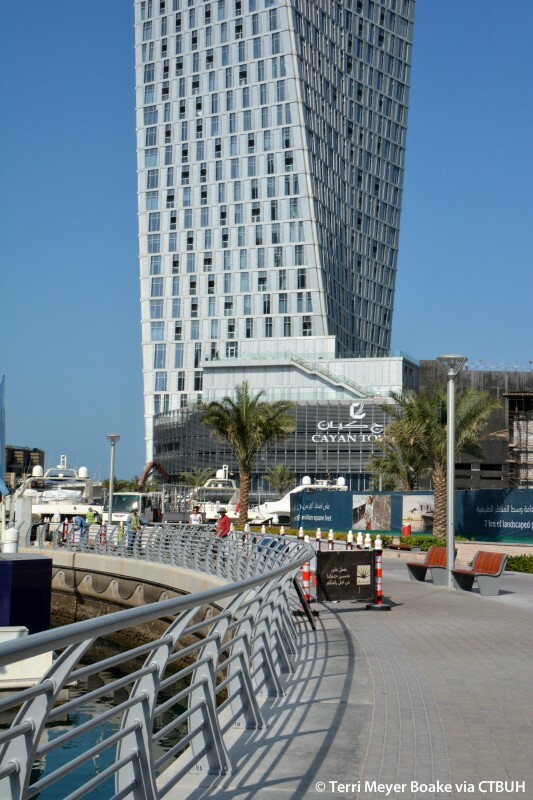 This enhanced design for solar control reduces the building’s demand for cooling, provides a thermally comfortable environment, and minimizes the risk of glare, while optimizing occupant views of the surrounding marina environment and gulf. 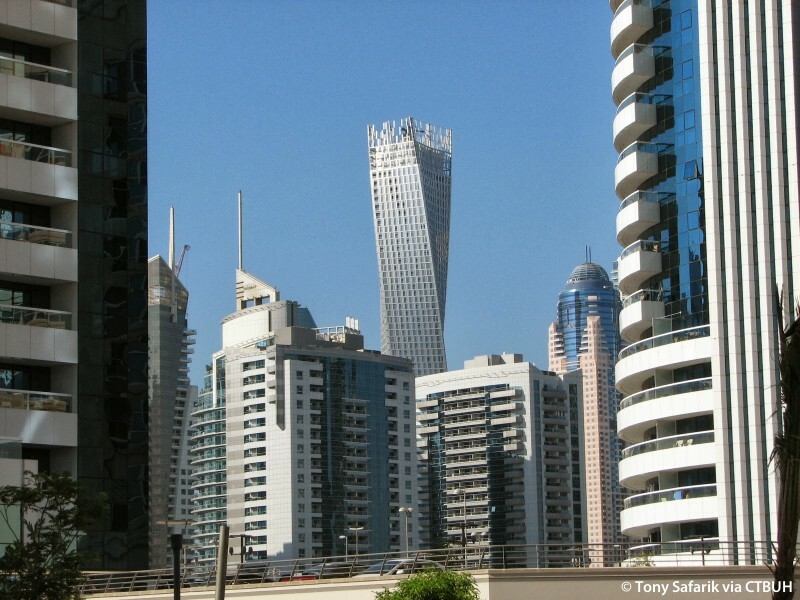 The tower’s HVAC system has been specially designed to deal with desert conditions. 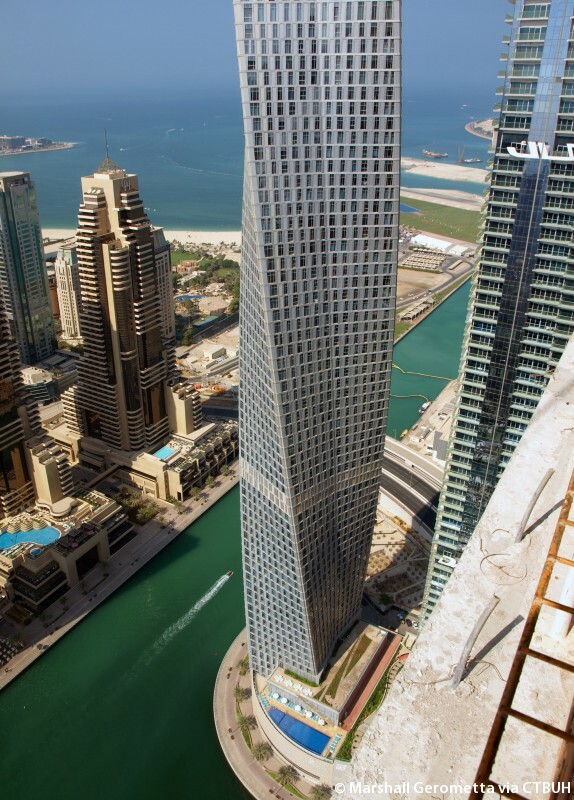 A central dedicated outside air system equipped with sand filters and heat pipes distributes fresh air across the tower. 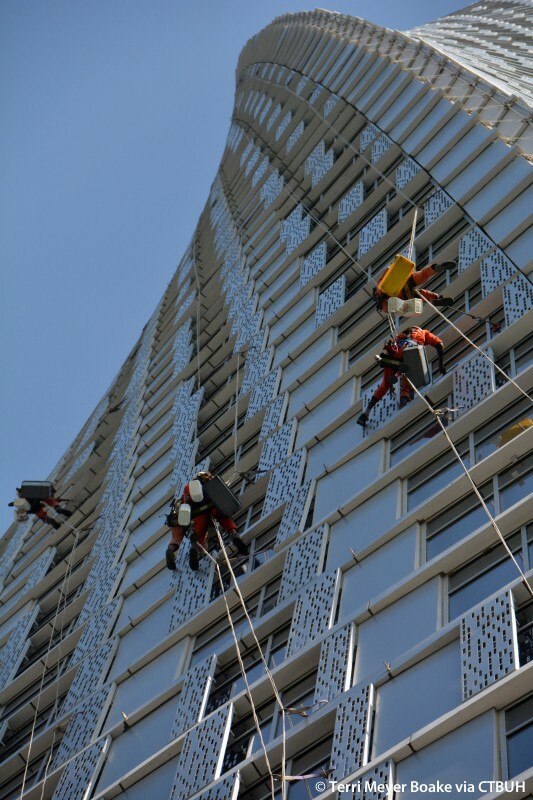 Fan coil units within the occupied space satisfy the cooling load while providing additional local filtering to reduce the level of fine particles entering through the façade. 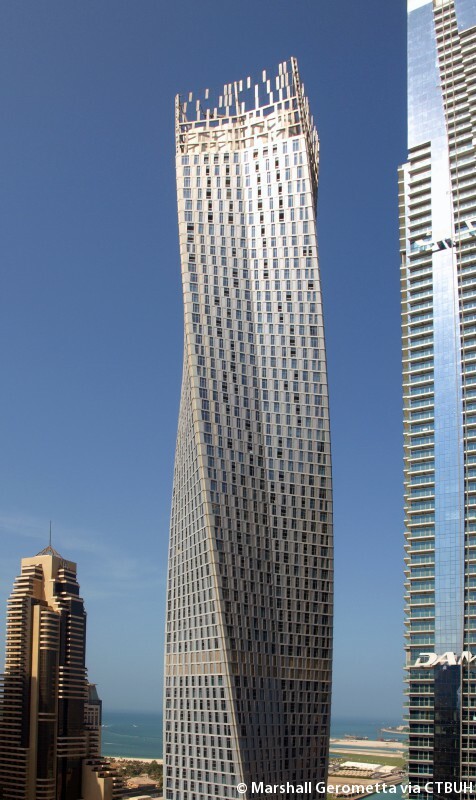 The tower’s helical form also acts as a shield from the northerly diurnal winds, which often carry sand and dust, thus minimizing the fine particles that may flow through the façade and impact indoor air quality. 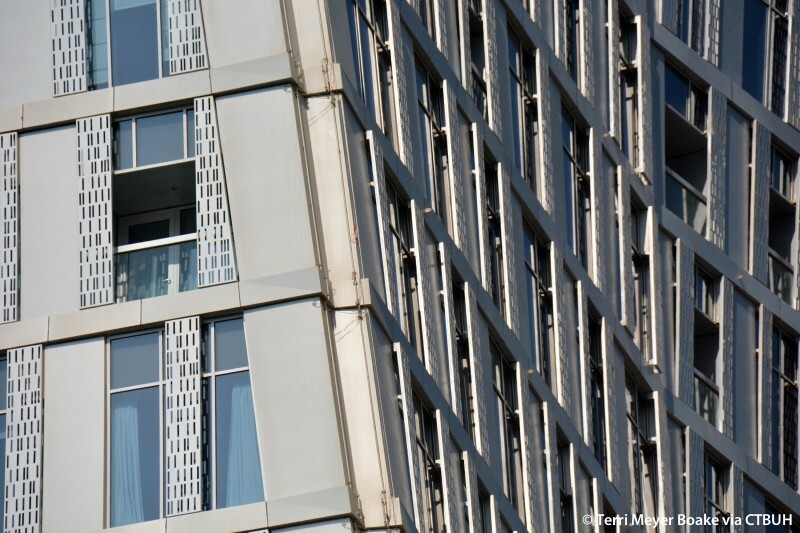 When outdoor conditions allow, windows can be opened so that natural ventilation can provide fresh air and passive cooling in interior spaces. 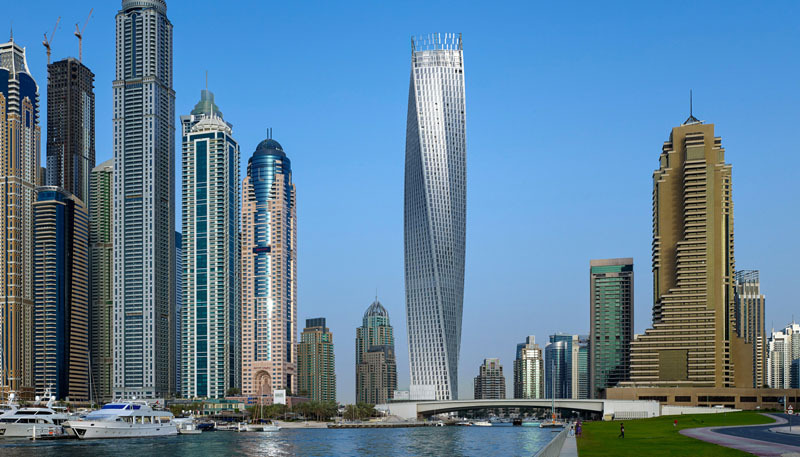 At night, when cool winds blow from east and west, a separate system that passively cools the tower’s slabs helps the building discharge excess heat. 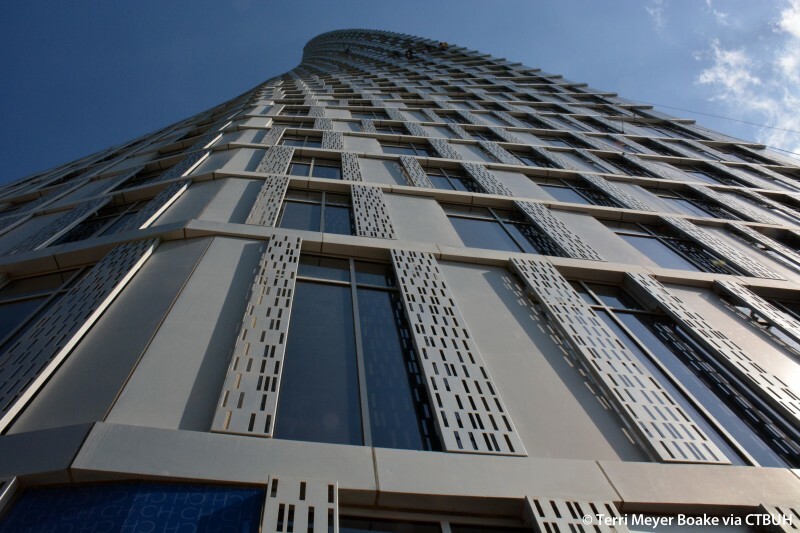 Outside air is naturally brought into the space and used to “purge” heat absorbed by the tower’s exposed slabs during the warmer day hours. 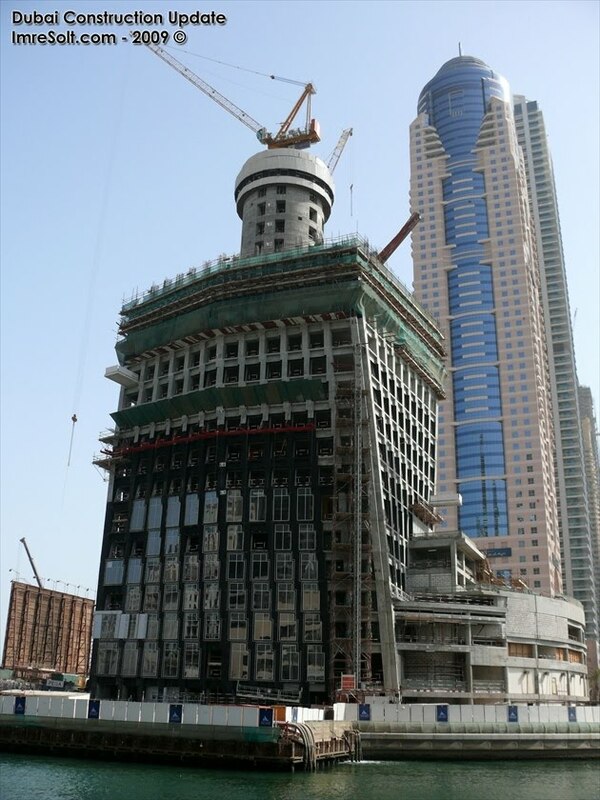 This cools down the thermal mass and restores the slabs’ thermal properties, enabling them to again absorb heat during the following day.